Did you - like me - have the fright of your life last night and woke up this morning to hear the that rumbling, shaking and banging was caused by an earthquake in Lincolnshire, can you believe that some people actually slept through the whole thing, a friend of mine did! We seemed to be spared of any damage - thank goodness but I just wondered if any problems had been caused in your gardens and on the plots. Anyone seen a mass evacuation of worms or toads or any other animals behaving strangely? Anyone had any damage to greenhouses or other structures? Just me being nosy. I hope it is another 24 years before we have anything like it again preferrably not as close next time! It may have been a baby, 5.2 or 5.3, but plenty big enough thank you! Click hereThere is lots more to be done before we are as secure as we would like to be so please keep supporting us. Charlie and Gill's Mutant Bramley? 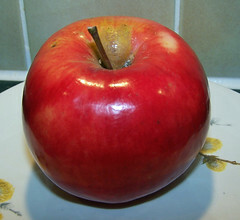 This beautiful shiny red apple may be delicious to eat but is it really a Bramley Seedling? That is what Charlie and Gill thought that they had bought when they chose the tree! It looks more like something out of Snow White and the Seven Dwarfs than a Bramley. If the authoring of this blog comes to a sudden end you will know that Charlie has 'done a wicked witch' on me!! Think about it! If I survive I'll tell you what it tasted like. Driving to work this week I just couldn't resist pulling up to take some photographs. Unfortunately I only had my mobile phone but it was better than nothing. The tree lined lanes were absolutely beautiful. These were not the most amazing views but it was where I found a pull-in and could take some snaps withouts causing a hazard. 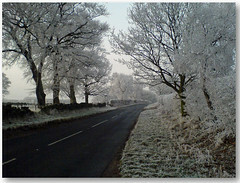 Apparently the apparition was caused by rime which was as a result of the extremely cold temperatures. Harrod Horticultural are offering 10% discount on all their netting products to customers ordering form our links. Click here to view the full range including the very popular Insect Mesh Netting, Heavy Duty Anti- Bird Netting and Butterfly Netting Harrod are also offering 10% discount on Standard and Superior Timber Raised Beds. Use the links here or on the shopping pages on our web site. To qualify for the discount quote Green Lane in the offer code box at the check out. We now have a new affiliated link - this time to Unwin's seeds and plants . This means that you have even more choice if you want to help our fund raising by ordering through our affiliated links. Every time you buy through our links you will earn us commission at no extra cost to yourselves - in fact some companies even give discount if you order through on eof our links! If it is too cold for you to garden and you enjoy puzzles. Try this Sudoku with a difference. 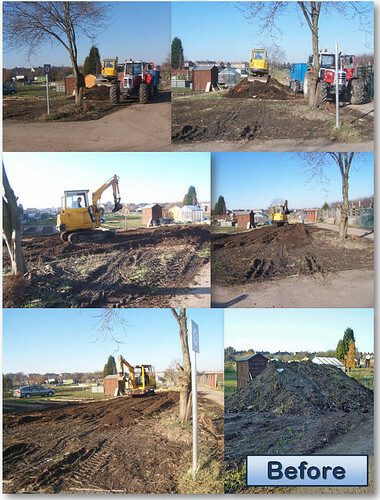 After unavoidable delay, the heap of rubbish was cleared from plot 46 on Sunday. This means that work can now start on construction on the plot. The first job will be to cover the plot with weed suppressant membrane - some of which is being stored on Matthew's plot - plot 13. If anyone is feeling in need of a bit of exercise then please feel free to start covering the plot. The next job will be to construct the storage bays - we have a possible source of free (damaged) breeze blocks but will need someone with a lorry or trailer to collect them for us - if anyone can help then please make contact. If you would be willing to give a little time to be part of the construction crew then also please contact me. (There will be lots of labouring work to do for those of us who wouldn't know one side of a breeze brick from another - so don't be shy). The more volunteers the better! EVERYONE will be welcome! All that we need is lots of enthusiasm. Thought you would be interested that one of the companies that is currently supporting us by offering commission on sales from their link has an interesting online forum. Why not pay it a visit - there is even a piece on it about us!! Click here to access the forum. Click here to visit our shopping pages with many links to Harrod Horticultural quality products. 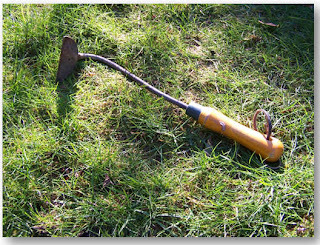 There is such a wide range of gardening tools and equipment available that a new gardener can often be bewildered when trying to choose what they should buy. Is there a tool or piece of equipment that you just couldn't be without? Help those new to gardening by telling us what it is and why it is so useful by posting a comment here. Personal I couldn't be without my hand held onion hoe. I only bought it last year and have found it to be really useful when weeding between closely set out plants - not just onions either! Phase 1 of our boundary replacement is now complete. 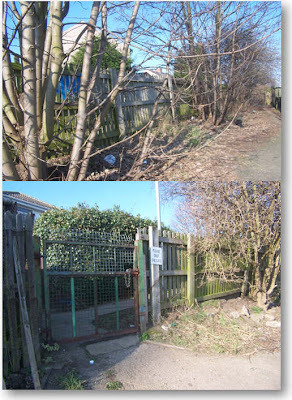 The contractors have done a good job for us and have also cleared away all the rubbish that someone fly tipped by throwing over the original fence. They also did some clearing outside of the gates - after the photos were taken. Thanks to Jan for 'supervising' the work! We now need to ensure that the gates are locked by whoever is in the last vehicle to leave the site. Could you please make sure that the padlock is easily accessible from the outside of the site when you lock up. Not to rest on our laurels I have asked the contractor to provide quotes for phase 2 i.e. the top section of fencing which is now our most vulnerable area. 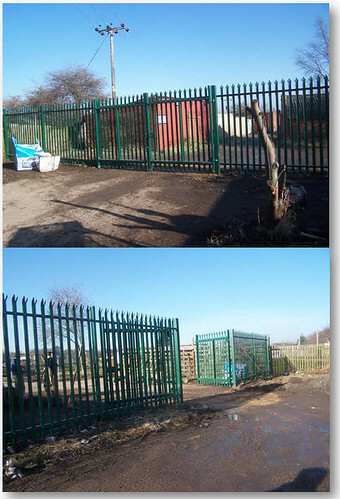 The contractors are going to quote for the top two gates separately so that if necessary we can divide up this work. Anyone with ideas for more fund raising - especially anyone willing to volunteer to arrange a fund raising activity please talk to me or email me about it. Again many thanks to those of you who have supported us through our blog and web site! Just a reminder of why we aren't there just yet! 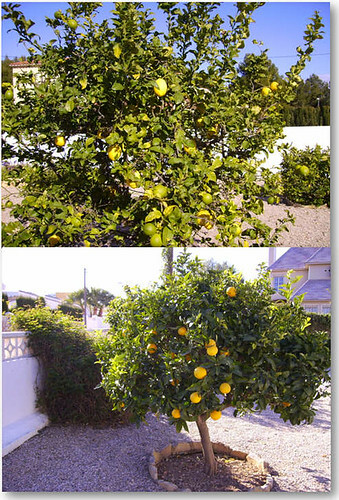 Joe took these photos in his friends garden during a visit to Spain last week. I have just created some shopping pages on our web site to make it even easier for those of you who would like to support our fund raising efforts to do so. To check them out click here. 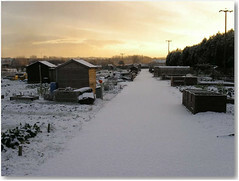 Last Saturday morning the snow didn't hang around for long, but it was long enough for Alastair on plot 56 to take a couple of atmospheric photos. He even managed to snap a steam train! 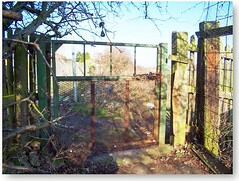 If you have taken a photo on the Green Lane site that you would like to share it with everyone then please email it to me with brief detail of where and when the photo was taken and I will pop it on the gallery page. If you don't garden on Green Lane I would also welcome any photos. It would be specially interesting to receive photos from other parts of the country or the wider world. Children why not send one of your photos and we will start a junior photographers' page! Look forward to hearing from you. Please don't disappoint me! Those of you who have helped our 'New Fence Fund' by using our affiliated links may like to know that the first phase of our boundary replacement is now under way. 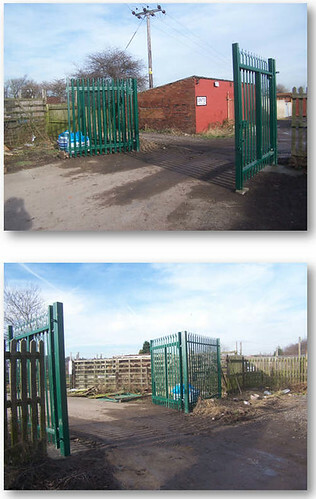 Work started on the new entrance last Thursday and so far the new gates have been erected. Hopefully work will continue on Monday when the adjoining fencing will be replaced. There is lots more to do so please continue to offer support by using our links. I am in the process of constructing some shopping pages to replace the Christmas gifts pages that have now been removed. Look out for discounts being offered by Harrod's Horticultural specifically for people using our site. Thanks again to those who have supported us - we couldn't have got this far without you! Ballots for election of members of the Management Committee, if required, shall be carried out and all voting slips handed in at least three days before the Annual General Meeting. The site secretary shall organise the ballot for election of officers to the Management Committee where this is necessary. Where necessary election of extended committee members shall take place within a fortnight of the ballot for the election of the management committee. If you wish to nominate anyone for the roles of Chair, Secretary or Treasurer can you please contact me - either personally or by email - and I will make sure that you are given a nomination slip. Could you please do this as soon as possible. If you wish to be considered as a member of the association committee then also please contact me. Please be assured that everyone is welcome should they wish to join the committee in any capacity. The annual general meeting is due to be held during the last week of March and I would be grateful for any comments regarding the timing and location of this meeting. An Annual General Meeting shall be held during the last week in March each year to receive the Committee’s report and accounts, and to announce the results of any election ballots to appoint members of the Executive Committee. This message has been emailed to all tenants who I have email addresses for and will also be posted on the notice board for those without email or access to the Internet. I would be very grateful, however, if you would pass on the contents of this post to any neighbour that you know of who does not have Internet connectivity as I don't want anyone to be left out of the loop! It would also help if existing committee members could let me know whether or not they would wish to be considered for places on the committee again this year. February's diary has been started on the web site. Click here if you want to visit. Must admit to not having done much on the plot for the past couple of months but we are now starting to think about the start of the season and the need to plan the plots. Don't be shy about posting comments on what you are doing on your plot or in your vegetable garden this month. Remember someone has to be the first to get the ball rolling and I really would like to hear from you!!! 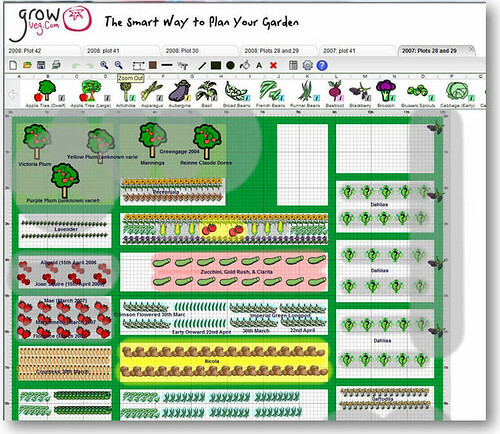 I mentioned a web site that can be used to produce plans for you vegeatble garden or allotment plot on a previous plot. We decided to 'have a go' with it and were really impressed. It has produced some really good plans. We have firstly set out the plans to reflect last year’s crop positions. It is really clever and ‘remembers’ where you planted things last year so that when you start to create this year’s plans it will indicate the areas that you should avoid planting crops in. We’d recommend that you have a play with the planner to see what you think of it. It won’t cost anything as the site offers a 30 day free trial period. If you then decide to subscribe it is only £15 for a year’s subscription! Click here to have a go.